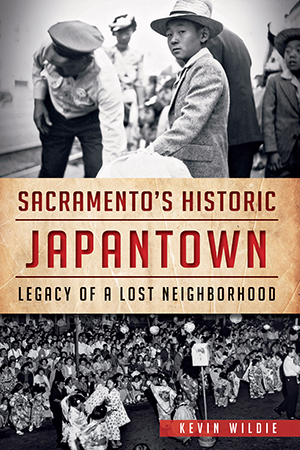 By 1910, Japanese pioneers had created a vibrant community in the heart of Sacramento--one of the largest in California. Spilling out from Fourth Street, J Town offered sumo tournaments, authentic Japanese meals and eastern medicine to a generation of Delta field laborers. Then, in 1942 following Pearl Harbor, orders for Japanese American incarceration forced residents to abandon their homes and their livelihoods. Even in the face of anti-Japanese sentiment, the neighborhood businesses and cultural centers endured, and it wasn't until the 1950s, when the Capitol Mall Redevelopment Project reshaped the city center, that J Town was truly lost. Drawing on oral histories and previously unpublished photographs, author Kevin Wildie traces stories of immigration, incarceration and community solidarity, crafting an unparalleled account of Japantown's legacy. Kevin Wildie has been an adjunct history professor for over ten years. His specialty is United States and Asian American history, and he currently teaches at Cosumnes River College in Sacramento, California, and Yuba College in Marysville, California. Wildie holds an MA and a BA in history from California State University, Sacramento. Donna Graves is the project director for Preserving California's Japantowns. Jill Shiraki is the project manager for Preserving California's Japantowns.